This hike was one of my “epic” hikes. 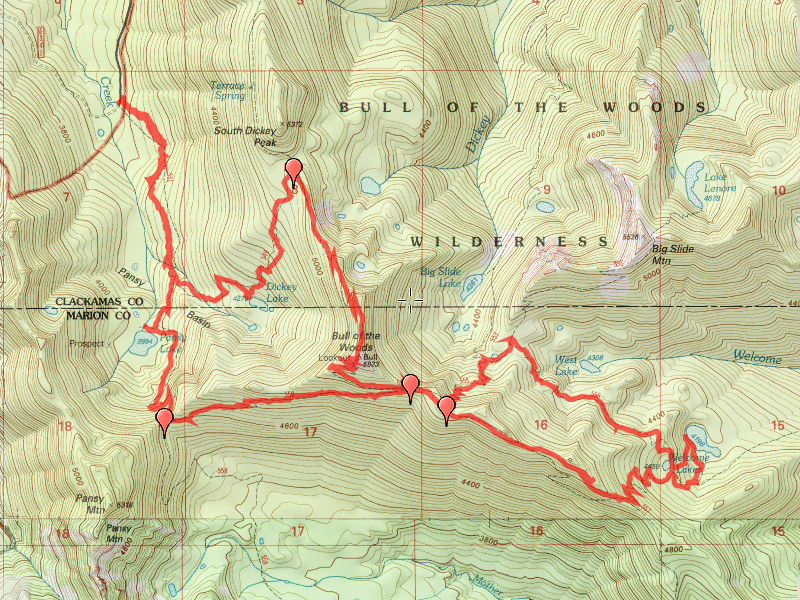 Anything over about 10 miles and/or very ambitious I consider an epic hike. This hike had LOTS of variation, and LOTS of elevation gain (3700′), some interesting landscape after the fires, and GREAT visibility to a bunch of mountains. The day started rather early, in order to make sure we had enough time to do the entire hike. We knew it would be challenging, especially if we wanted to take our time and be able to look at things and take pictures along the way, rather than just powering through the hike to get it done. We were figuring about 8 hours of hiking, and we were pretty much dead on. 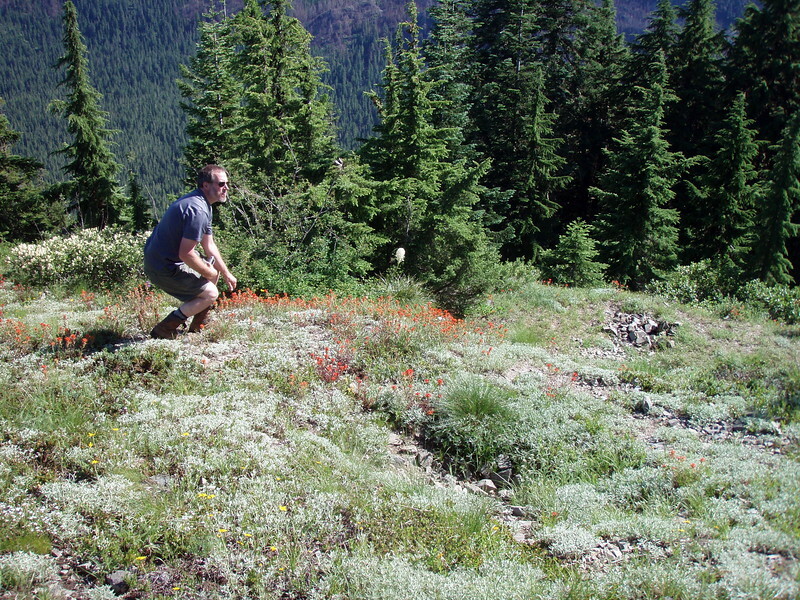 We started up the Pansy Lake trail, looking downhill for old trail bench. 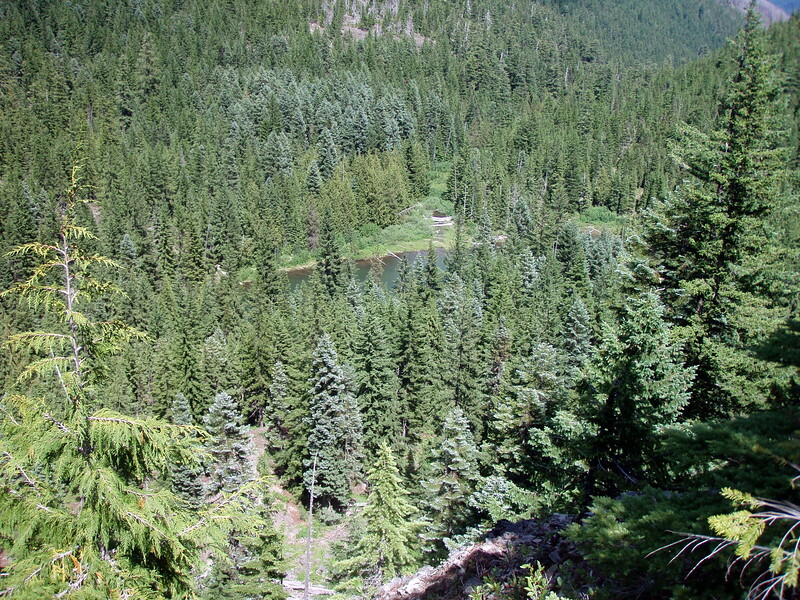 We had been told that there was the “old” Pansy Lake trail that was further downhill from the current trail. We didn’t see much evidence of a trail downhill, but we were more excited to get going on the days hiking, too, so we may not have been paying close attention. After a short hike (a mile or so), we got to Pansy Lake, where we met a couple (and their dog) who had camped there for the night. We put on bug spray at that point, because the bugs were starting to bother us. We hiked part way around the lake, and then went back to the trail where we continued up the hill to its junction with the Motherlode trail. 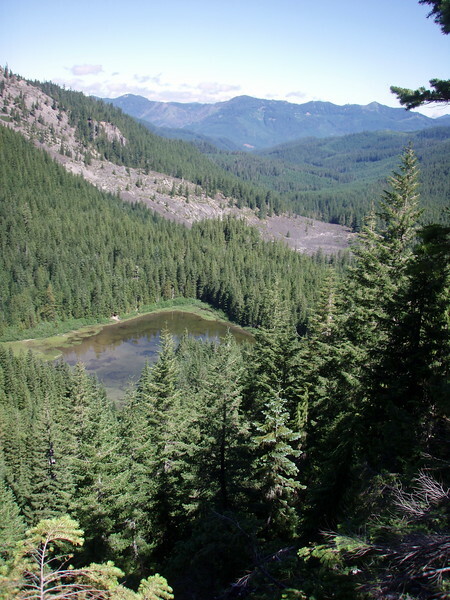 There are some magnificent views on this upper stretch of trail – rock slides where you can see the whole Pansy creek drainage. The visibility on this day was exceedingly good – better than I have seen in quite some time. The other thing about the weather was that it was a nice temperature – we were working hard, so it was nice that it wasn’t too warm. It was probably in the upper 60s or low 70’s during the day. We reached the saddle where the Pansy Lake trail ends at its junction with the Mother Lode trail. We stopped here for a few minutes to rest, eat and drink some water. We had to plan our water refills carefully since there weren’t a lot of good places to get water, and due to the sun and the elevation, we were using a fair amount of water. After a short break, we continued down the Mother Lode trail. This trail was in pretty good shape, although it did get a little brushy in places. I forgot to mention, when we were driving into the trailhead, we passed a couple of horse trailers that were on their way out. They had stayed at the Pansy Lake trailhead, and had been doing some trail maintenance. There were quite a few logs down that had been sawed out by them – If any of you are reading this – THANK YOU! We proceeded pretty much uneventfully down the trail, enjoying a number of large trees along the trail. The trail heads uphill along this stretch, but it was pretty well graded. We eventually came to the junction with the 554 trail, where we found a woman enjoying the sunshine on the ridge. She was a little confused as to which trail she should take, so we helped her understand the trails. We then proceeded down the trail towards the Schreiner Peak junction (we had originally intended to hike down to Lake Lenore on the Schreiner Peak trail). We came to the junction, and thought it was the wrong trail and continued along the Welcome Lakes trail until we got to the beginning of the burned area from the fire last year. At this point, we took another look at the map and realized that the junction we had passed was the right one. After some discussion, we decided that we would continue down the Welcome Lakes trail and make the loop back on the West Lake way trail. Lake Lenore would have to wait for another day. The burned area was fascinating to see. There was a very definitive line where the fire stopped, and where it burned, it burned HOT. And pretty much completely. 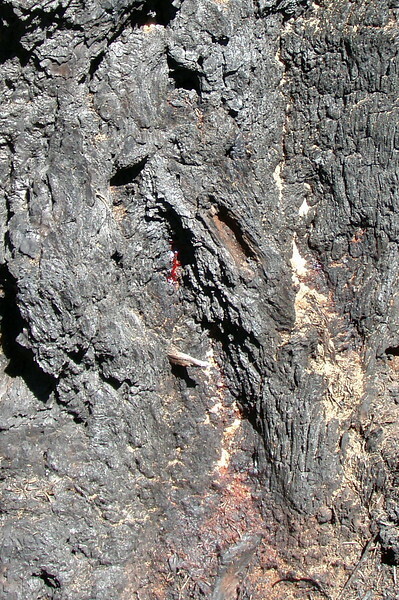 We saw trees with sap on the bark that looked red – it almost looked like the trees bled, which they probably almost did – the sap was probably boiling in the trees since it was so hot. Many trees have already lost their bark. 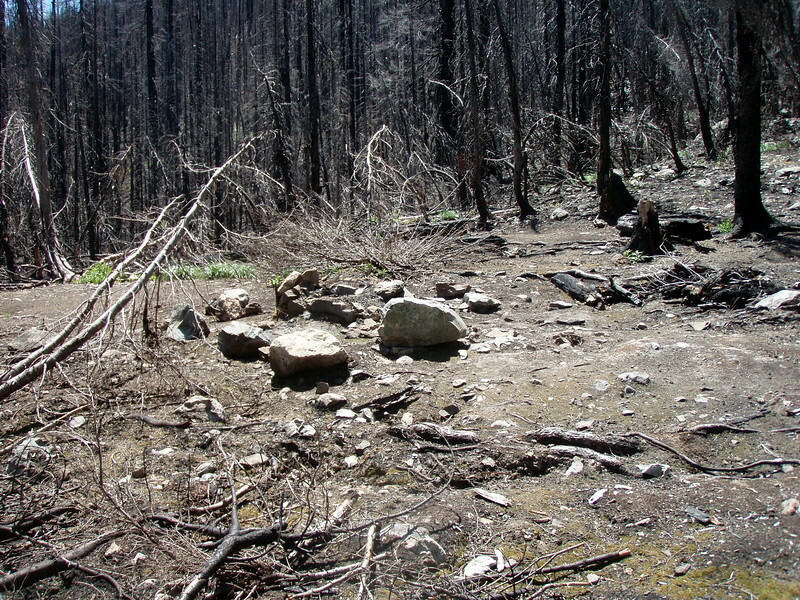 The good news is that the Welcome Lakes trail was still recognizable for the most part. Only a couple of sketchy parts. The bad news is the the Geronimo trail (which I did with Carly a few years ago on another long loop) looks like it might be lost now. 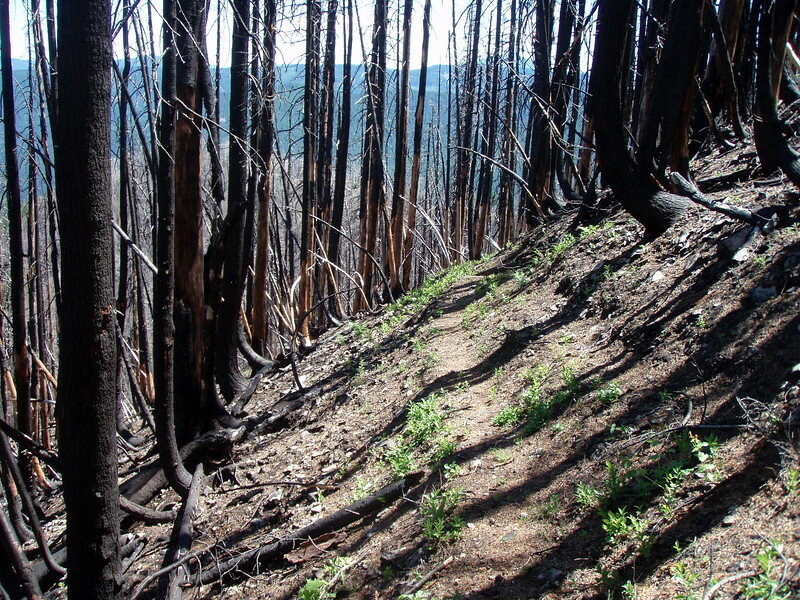 I didn’t go down the trail at all, but it was a little sketchy before, and now with the burn it may be lost. The trail down to upper Welcome Lake (the smaller one) was pretty easy to follow through the burned area – once we got to the campsite at the lake, we stopped to have lunch and get water. 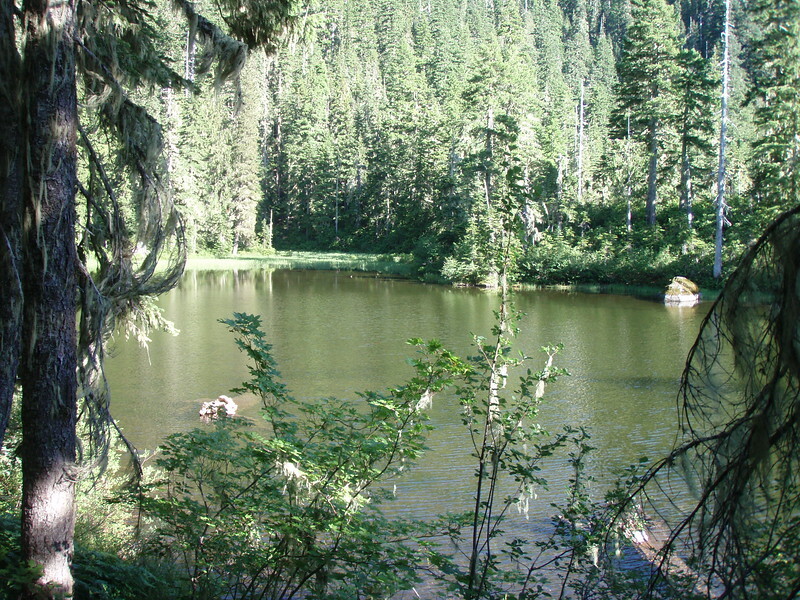 I had heard that Welcome Lakes was “charcoal” and they weren’t kidding – there is nothing left as far as trees, but the huckleberries, rhodies and thimbleberry were thriving in the spring above the lake with all the sun. This will be an EXCELLENT place to pick huckleberries in a few years I think. After having some lunch and filling our water, we headed down to the lower Welcome Lake. The trail junction is very apparent, but the trail quickly disappears. We looked and looked for it, but it was destroyed in the fire I think. 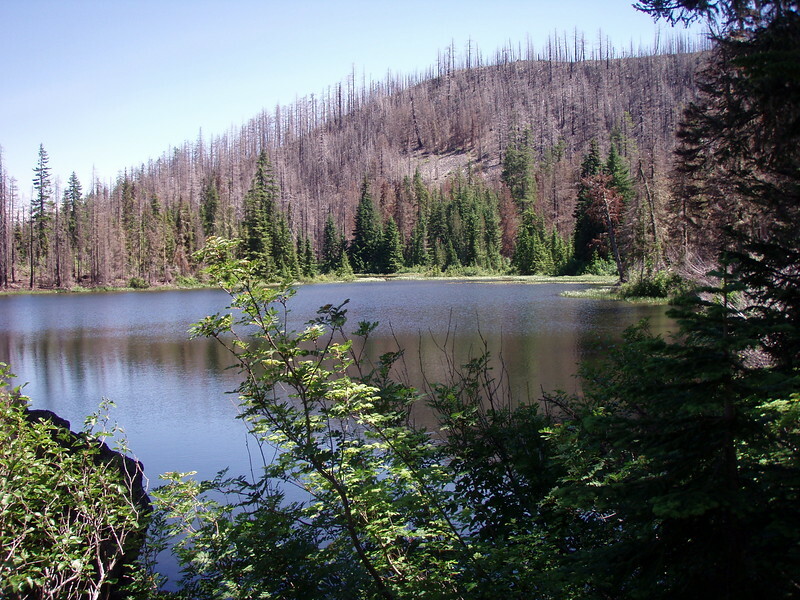 There isn’t much down by that larger lake anymore, although there are a few green spots – somehow they escaped the fire. We ended up just walking back up the hill since there wasn’t a trail – back up to the upper lake. It is really interesting how open things are now, and how much different it is than it used to be. It used to be you couldn’t see the lower lake until you were almost on top of it – now you can see it from the trail above. 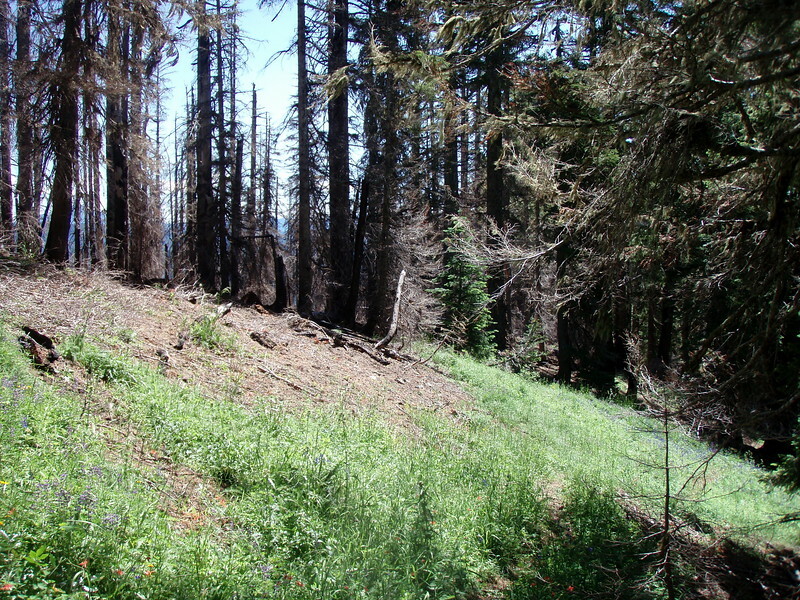 After getting back up on the trail, we headed back up the West Lake way trail, continuing through the burned area for a while. West Lake was unaffected by the fire – it was kind of nice to be back in the trees and green after being in the burned area. We then came to the junction with the Schreiner trail (the one we were supposed to have taken) – we stopped at a little creek to fill up with water – it was ICE COLD and DELICIOUS! Then we proceeded to go up the brutal switchbacks back up to the Welcome Lakes trail – IT IS STEEP. After arriving at the Welcome Lakes trail, we proceeded west back to the junction with the 550 trail, and headed up to the lookout. The lookout is faring OK, but one of the windows is broken now sicne the shutter came off a year or two ago and the glass is unprotected. The wildflowers were in full bloom up there! We stayed for a while, enjoying the views and the breeze – by this time it was getting rather late, so we figured we should head down. North down the 550 trail we went, looking for telephone insulators, which Kirk found a bunch of! At the junction with the 549 trail, we headed southwest toward Dickey Lake. When we got to the lake, it was a pretty small, shallow, brushy lake. Interesting, but not too interesting. After a bit of exploring, we went back to the trail to finish our day. Back to the Pansy Lake trail and then north back to the truck. On the way back, we did see what might have been part of the old trail – at a switchback, the trail appeared to keep going and then switchback a little lower down the hill. That exploration will have to wait until another day – along with the Pansy mines. We finally arrived back at the truck a little after 6 – tired and sweaty. We stopped for a burger at Fearless brewing in Estacada – boy, those burgers taste good after a long day of hiking!!!! Truly a day to remember.